"'Kala Chola' is a Pakistani dish that can be served as a meal, with rice, or just on its own. 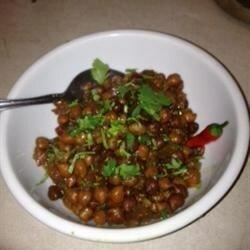 It is made with kala chana, which is in the family of garbanzo beans. You can find them in Indian/Pakistani stores or in the Indian/Pakistani section of an international store. It is really tasty and very popular in my home. According to my mom (a diabetic), kala chana are high in fiber and low in fat. It is great for people with blood sugar problems. Serve by garnishing with onion and cilantro with basmati rice. Hope you all enjoy it." Place garbanzo beans in a large bowl. Pour enough water over the beans to cover by several inches. Soak 8 hours to overnight. Rinse and drain the garbanzo beans thoroughly. Combine garbanzo beans, 3 cups water, tomatoes, 1 finely chopped onion, jalapeno pepper, vegetable oil, salt, turmeric, ground red chile pepper, and dried whole chiles in a large pot over medium-high heat; bring to a boil, reduce heat to medium-low, and cook until the garbanzo beans are tender, 3 to 4 hours, adding water as needed to keep about 1 inch of liquid at the bottom of the pot. Garnish with cilantro and 1 tablespoon finely chopped onion to serve.